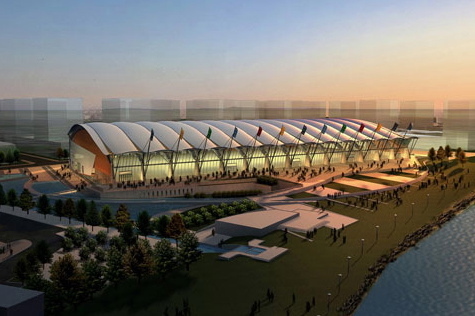 How the speed-skating oval for the 2010 Winter Games might just make engineering the new architecture – one two-by-four at a time. Rain streams around my yellow plastic hard hat, down my collar and under my orange safety vest. Blinking away the relentless drops, I gaze up at the half-built wooden roof of the speed-skating oval for the 2010 Winter Games. I’m in Richmond, near Vancouver, with structural engineer Gerry Epp – one-half of innovative engineering firm Fast + Epp – watching a crane lower into place one of the last of these 13-metre-long roof panels, curving plywood plates on top, grooved trusses below. The bottom trusses are fashioned from a filigree of two-by-fours, which from this distance look like toothpicks. When it’s finished, the roof will cover 6½ acres, roughly the size of four and a half football fields. Engineering is no longer about simply constructing buildings the way a child assembles Lego bricks, and Paul Fast and Gerald Epp thrive because they are the rare engineers who speak the language of architecture. (Their mission statement proclaims: “Good structure is good architecture.”) Vancouver’s architectural elite, such as Arthur Erickson, Bing Thom and Peter Busby, like working with them because they understand an architect’s desire to shape never-before-seen designs but have the focus to ground such visions in material reality. Both raised as Mennonites with roots in rural Manitoba, Fast and Epp bring a moral and almost spiritual dimension to their work. They start every meeting with a prayer, and they believe that engineering can, if not save the world, certainly make it better. Trev had not gotten it. Like much engineering, the oval is both simple and complex. Simple, because it’s a big wooden roof built from little studs, plywood and glulam beams standing up under the force of gravity, and complex, because, just for the heck of it, the lowest point of the arches looks like a rack of gargantuan skate blades. Our coats soaked through, Epp and I finish the tour in Richmond with a look at the soaring end sections, where the roof’s feathered edges spread out and upward like a gliding hawk. (The oval can be seen clearly by travellers making westbound approaches to nearby Vancouver International Airport.) Just then, a construction-site safety officer strides up to Epp, points at his soaked hand-tooled English brogues and asks, “Are those steel-toed?” Moments later, I’m busted for my Italian hiking boots.